Orange City Council regulates parking around Orange with the aim of delivering safety for drivers and pedestrians, and sharing the available parking spaces fairly among all drivers. Parking areas and time-limited parking zones are provided by the City Council to ensure Orange’s retail and business areas are accessible and fairly available to all. The Council regulates parking in these areas by putting limits on the permitted parking time. While Orange City Council employs parking officers to enforce local parking zone regulations, the council pays the a state government agency, Revenue NSW, to handle the payment of fines as well as deal with any disputes over parking fines. If you receive a parking infringement notice you should contact Revenue NSW to request a review and to resolve any issues you may have. Orange City Council supports charity and volunteer community groups by making arrangements to let group members have extended parking in time-limited parking zones. This arrangement lets a set number of parking permits to be issued to organisations to be used by group members to park in an area nearby to where the volunteer work is happening. The permits would be in the form of a printed card placed inside the windscreen of a car, which would prevent a parking fine being issued. The system aims to support the volunteer work while making sure nearby businesses are not impacted by the loss of parking spaces for their customers. Community groups that want to apply for permits, can write to the council using this form. The group would outline when , where and how many cars would be using the parking permits. Council staff will consider the merits of each request. Where a privately-owned car park is proposed, the council would also need written consent from the management of the shopping centre. Orange City Council introduced a system of car-mounted number plate recognition (NPR) to manage parking in February 2016. The system is mounted in a marked council car, with signs stating ‘Orange City Council Mobile Parking Patrol.’ The equipment consists of a car-mounted fixed camera linked to a lap-top. The system is operated by two council parking officers, one driving the car and one operating the equipment. As the car drives along, the camera takes photographs of parked cars in time-limited parking zones. The exact time, date and location of each photograph is also recorded in the computer. The computer also analyses the image and records the number plate details. When the patrol car makes another pass through the same area, it compares the number plate details and can determine if a parked car has over-stayed the time-limit. The parking officer then parks the patrol car nearby, and walks to where the potential offending car is parked. After checking that there are no mobility (disabled) permits or residents parking stickers on the car, an infringement notice is left under the car’s windscreen wipers. This video was produced at the time the system was first introduced. How will I know if my ‘over-stay’ has been detected by the NPR system? Drivers won’t know if their car has been photographed by a passing parking patrol car. No chalk marks are left on the tyres. If your car has been detected as over-staying the parking limit, a printed infringement notice will be left under the windscreen wiper of your car. Where else can I park? This map shows the locations of a number of car parks throughout and nearby the main shopping area of Orange. Many of these car parks include all-day parking. 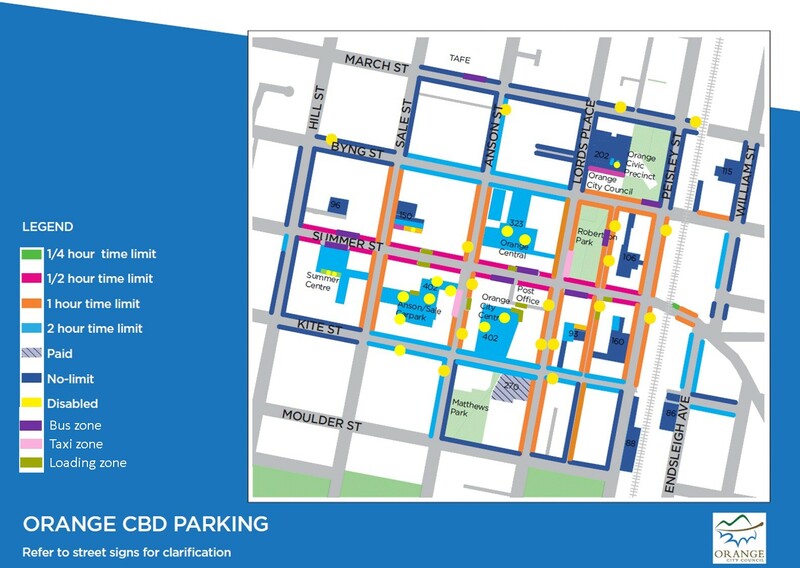 There are also a number of streets within a few minutes walk of the CBD with no time parking limits. Can the camera detect my ‘Mobility Permit’? Drivers with mobility permits, issued because of a disability or other medical issue, know to attach the permit where it can be clearly seen from outside their car. Parking patrol officers will look for mobility permits before placing an infringement notice under the car’s windscreen wiper. How much is a parking fine? The offence of parking in an area longer than allowed currently carries a $112 fine. The offence of parking in a disabled car parking spot without authority carries a $563 fine (with a loss of 1 demerit point). These penalties are set by the NSW government, not by Orange City Council and are used throughout NSW. Can I appeal against a parking penalty? A driver’s right to appeal a fine imposed by the new NPR system is the same as for any other penalty notice. The fine payment system is managed by Revenue NSW. Appeals and letters should be sent directly to the address on the infringement notice. Has this system replaced parking patrol officers on foot? No. In council-managed car parks and in street parking areas, the intention is that Orange City Council will continue to use parking officers on foot as well as the car-mounted system. Orange City Council has a limited ‘Residential Parking Scheme’ which is aimed at assisting residents who live in time-limited parking zone areas. In two defined areas of Orange where there is a very strong demand for parking during business hours, Orange City has established a card-based scheme to let residents park outside their homes without being booked. The scheme is limited to two areas. Anson Street between Moulder and Kite Streets (167 to 177 Anson Street). The scheme is open to residents only, not business tenants. Property owners need to ensure that any new tenants are notified to apply to the City Council for a card which is placed inside the car where it can be seen by a parking inspector. The cards include the car rego numbers and must be clearly displayed on the dashboard within the vehicle. New cards are issued every financial year and are issued to residents only. If the owner lives elsewhere, it’s their tenant who is entitled to the card.